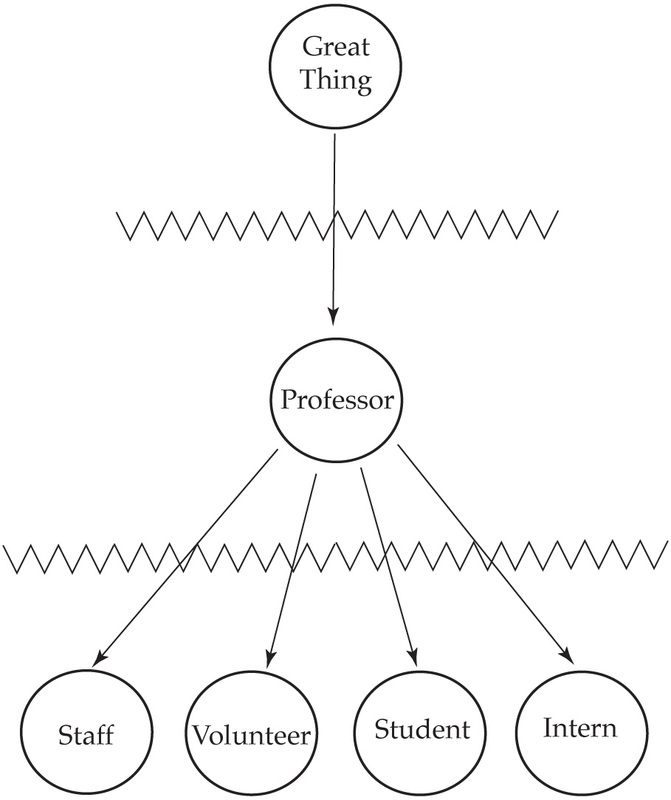 Top Down Authority Interpretive Model. Adapted from Parker Palmer, The Courage to Teach, p. 100, Fig. 4.1, 1998. Okay – this is a real get up on my soapbox and preach posting – kind of a continuation of last week, so here goes. In every college level course I teach, the first day of class I go over some ground rules. One is that I understand there are two different types of learning. The first is the one shown here, as adapted from Parker Palmer’s book The Courage to Teach. This top down approach is where the instructor is the intermediary between the great thing being studied and the student. The student only gets access to the great thing through the professor. In this way, the professor plays a role like a traditional shaman or Roman Catholic priest intervening with the spirit world. I let students know I don’t approach education in this way. I let them know they will all have speaking parts in the class, like it or not. The second model of learning I pose, is also adapted from Palmer (illustrated in last week’s post). In this model everyone has equal access to the great thing. The instructor’s job is to facilitate that access. Archaeologist – So what do you think these headless figurines are all about? 5th Grader – They didn’t have camera’s back then did they? Archaeologist – No they did not. 5th Grader – Well maybe instead of having a picture on the mantle of their grandma or grandpa who lived far away, they kept this statue and when the person died they broke the head off because they were dead. Archaeologist – Hmmm . . . that sounds like a pretty good idea. I like it. Has anybody else got any other ideas?
. 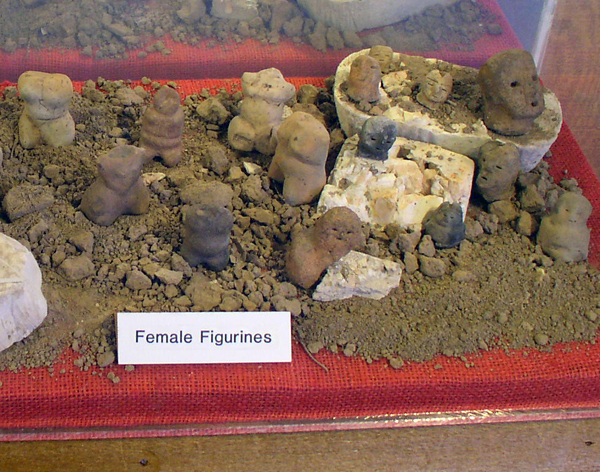 . . and the fact is, the 5th graders response better accounts for the actual presence of the figurines in the archaeological record than the conventional wisdom passed along by archaeologists. In the top down teaching method, if the question is even asked, the teacher would not validate the 5th grade girl’s response but would steer the discussion back to conventional wisdom. The integrative approach allows, invites, relies on, and mandates the 5th grader to engage. I find in archaeology that we struggle with how to make that engagement truly reciprocal and integrate the visitor into the experience. How do we move from a simple hands-on experience that is often just a gimmick to get more people to visit our institutions to a true participatory experience where the 5th grader becomes a stakeholder in the cultural heritage of the built environment where they live? How do we validate and engage the 5th graders response to the question? The memory stations where visitors leave their impressions has become a popular means to create at least the illusion of participation. However, what do we do with all of those post-it notes when the boards start to fill up? On those boards, how do we distinguish between the 5th grade girls response that I perceive as of value, and an interpretation that I do not consider of value? For the Poverty Point site, Debbie Buco a TAG (talented and gifted teacher) from the Baton Rouge Louisiana school system composed a fabulous classroom activity volume, Poverty Point Expeditions, that uses the archaeology of the site to teach a range of subjects in the K-12 system. In those activities students create stories, artifacts, conduct ethnoarchaeology experiments and more. Over the years, the results of several student projects from this volume produce results that rival the conventional wisdom of professional archaeologists, like my 5th grade example above. Where does all this stuff end up? Here is one solution I saw of late – The University of Memphis Art Museum recently installed a temporary exhibit of the well-known architect Paul R. Williams. In one adjoining gallery a Department of Architecture Masters degree project presentation was hung. In a second adjacent gallery, the architecture projects from the Coro Lake Elementary school in Southwest Memphis were on display. Three exhibits that show the architectural skills from the elementary school to the professional. A very cool idea. I am struck that our true challenge is to take the folks we do outreach with from individuals with a passing interest with whom we occasionally engage in archaeology day or hands-on activities and move them to becoming true stakeholders in the cultural heritage of their built environments. Reminds me of 5th-grade class looking at slide of Pyramid of the Niches at Tajin [Mexico] and student saying, “Oh that is just like those pyramids in Asia” (meaning Angkor in Cambodia). Yes, there are similarities that go far beyond likelihood of chance, but when we very few professional archaeologists broach this, we are dismissed as foolish, papers on the sub ject do not get published; not even the Kensington (MN) runestone dated by its runes AD 1362, in the middle of the 450-yr use of NE America by Greenland Norse, is allowed to be seriously discussed. The runes carved into a highly metamorphosed very hard graywacke show weathering along their edges which proves right out that they predate settlers in the region (beginning 1870s), a fact pointed out by an eminent geologist in 1910 whose solicited examination of the stone and find story was rejected by the Minn. Hist. Society which still rejects any argument for its authenticity, as does the Smithsonian.